OMEGA was designed for use with the large libraries required for computer-aided drug design. It generates multi-conformer structure databases with high speed and reliability. OMEGA performs rapid conformational expansion of drug-like molecules, yielding a throughput of tens of thousands of compounds per day per processor. OMEGA is very effective at reproducing bioactive conformations [1,2], and provides an optimal balance between speed and performance when used on large compound databases . 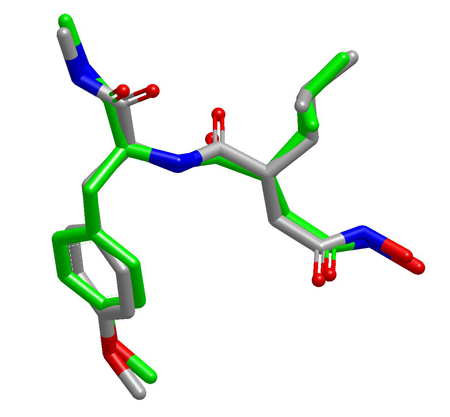 OMEGA conformational databases can be used as input to a variety of applications including docking engines (FRED), shape comparison tools (ROCS) and pharmacophore perception algorithms. OMEGA's knowledge-based approach produces high-quality conformers, superior to those of many other methods . It has also been found to be the fastest of commercially available conformer generators . OMEGA reproduction of a high-quality ligand structure from the PDB with RMSD < 0.75 Angstrom. Conformer Generation with OMEGA: Algorithm and Validation Using High Quality Structures from the Protein Databank and Cambridge Structural Database, Hawkins, P.C.D., Skillman, A.G., Warren, G.L. Ellingson, B.A. and Stahl, M.T., J. Chem. Inf. Model., 2010, 50, 572-584. Conformer generation with OMEGA: Learning from the dataset and analysis of failures, Hawkins, P.C.D., Nicholls, A.N., J. Chem. Inf. Model., 2012, 52, 2919-2936. Conformational Analysis of Drug-like Molecules Bound to Proteins: An Extensive Study of Ligand Reorganization upon Binding, Perola, E. and Charifson, P.S., J. Med. Chem. 2004,47, 2499-2510. High-Quality Dataset of Protein-Bound Ligand Conformations and its Application to Benchmarking Conformer Ensemble Generators, Friedrich, N.-O., Meyder, A., de Bruyn Kops, C., Sommer, K., Fachsenberg, F., Rarey, M., Kirchmair, J. J. Chem. Inf. Model. 2017, 57, 529-539. Benchmarking Conformer Ensemble Generators, Friedrich, N.-O. de Bruyn Kops, C. Fachsenberg, F. Sommer, K., Rarey, M. Kirchmair, J. J. Chem. Inf. Model. 2017, 57, 2719-2728.